I absolutely love the television series “Pushing Daisies.” Though sadly not on anymore, Pushing Daisies was set in a whimsical land of technicolor coloring and vintage cars, Pushing Daisies is about Ned (“the piemaker”), who runs a pie shop and has a gift of waking the dead (sounds morbid, I know, but it’s really not) with the touch of the finger. Normally, he uses this gift to solve crimes, keeping the dead person alive for 60 seconds to ask who killed them. If he keeps them alive for longer than 60 seconds, then someone else has to die. 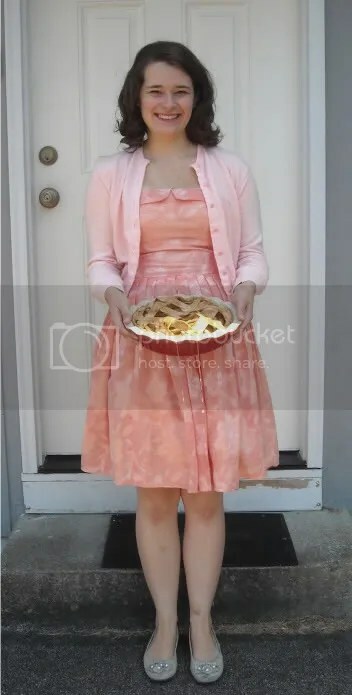 The pie was made for a craft day that I went to yesterday, with one the gals that I went to high school with. She knows how to knit and I know how to sew and we decided to trade skills! It was incredibly fun and I’m now working on knitting a scarf (way easier than I thought it would be and such a fun and portable hobby). Thank you so much, Sophia! I agree, the color is fabulous (thanks for that one, Pushing Daisies costume designer!). Your circle skirts are fabulous, btw!